Glass Touch: No Cleo! NO! Cleo!!!!! NO! Cleo stop!!! It has been a year since we brought precious little Cleopatra home and we no longer have a single blanket that has not been impacted. Knowing I would be spending part of January convalescing at home, and hoping (foolishly) that Cleo at 15 months would begin to outgrow this bad habit, I broke down and purchased a new blanket. Poor thing (the blanket not Cleo). It wasn't in the house 24 hours before we noticed the first signs of damage. Isn't she the cutest little monster you have ever seen. Funny thing though. She has a blanket in the crate where she sleeps. She hasn't chewed that one up at all, go figure. Not that I'm bitter. 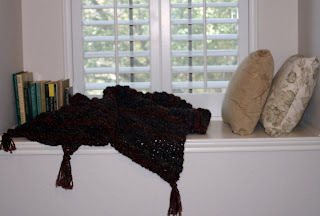 So in need of a blanket and with more then sufficient yarn and time on my hands, I set out to crochet a small throw. Something easy to use and then store in a protected location, like a vault. Here is what I came up with. I used two strands of yarn, one Lions Brand Homespun Corinthian and the other Bernat Berrella "4" in Terra Cotta Mist worked together with a Q hook . The Berrella, a medium weight yarn, was for added thickness and warmth. 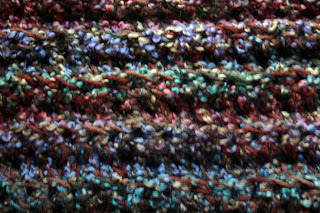 The color blended into the blanket and what is seen is mostly the charater of the Homespun yarn. The Q hook made for large soft stitches and quick easy work. This item was simple to make. and a good project for any beginning crocheter. I chained the width of the thow and then began to single crochet (sc) across the entire width. At the end of each row I chained one and turned. I then worked the entire row in sc again making each stitch in the back loop only and repeating this process until I reached the desired length. Pretty simple. Now the really challenge. Protecting it from Cleo. I'm almost afraid to use it. Maybe I should start making our blankets out of Kevlar.